It looks like Samsung’s Note 9 is set to be revealed on August 9th at the company’s next ‘Unpacked Event,’ according to a report from Bloomberg. This date comes in at two weeks earlier than when the Note 8 was announced last year. In terms of a retail release, Samsung reportedly plans to release the phone by the end of August. This also gives the South Korean a head start on Apple and the company’s next iteration of the iPhone, which likely won’t be released until sometime in late September. Some reports stated that the Note 9 would be released even sooner than August 9th, though new rumours indicate the phone’s release was pushed back due to last-minute design changes. Bloomberg says that Samsung will include an upgraded camera in Note 9, which likely indicates that the phone will feature the variable aperture functionality included in the Galaxy S9. The publication also says that the Note 9 will include Qualcomm’s Snapdragon 845 in North America. While it’s possible that the Note 9’s release could end up shifting, given that past Note devices have dropped in August, it makes sense for the Note 8’s successor to drop in that month as well. While it initially seemed like the Note 9 might feature an in-display fingerprint sensor, the latest reports indicate Samsung’s next phablet won’t include the often-discussed feature. 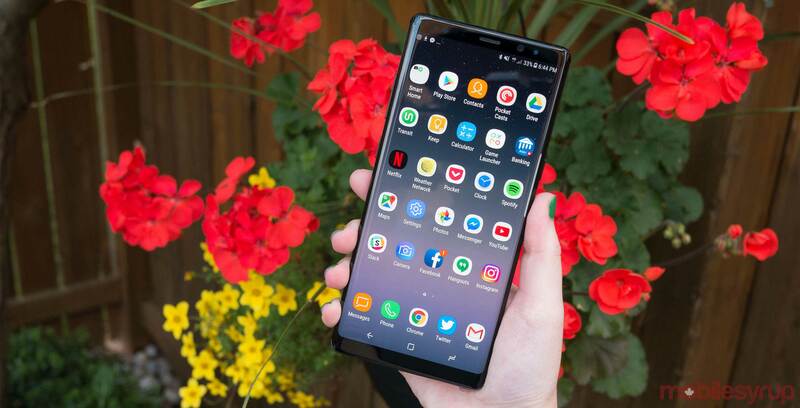 Back when I reviewed Samsung’s Note 8, I described the smartphone as one of the best all-around Android devices on the market, though its high price tag was definitely a point of contention.